If you didn’t have a chance to experience totality on Aug. 21, 2017 you might want to plan where you want to see it next time. Even if you don’t go you might know someone who will. So save those eclipse glasses if lucky enough to have a pair. Carbondale, IL will again be dead center when the eclipse path crosses the United States. But the path of the 2024 total solar eclipse will cut the opposite direction. It will go from Mexico in the southwest to Maine in the northeast as it moves across Texas, Arkansas, Indiana, Ohio, New York and Vermont. Consider then, taking a spring vacation in Austin or Dallas Texas, Indianapolis, Toledo or Cleveland, Ohio or the Buffalo, Niagara Falls area or even Montreal. Chicago won’t be in the direct total solar eclipse path until Sept. 14, 2099. To go now to walk across the map visit Adler Planetarium’s “Chasing Eclipses” exhibit. 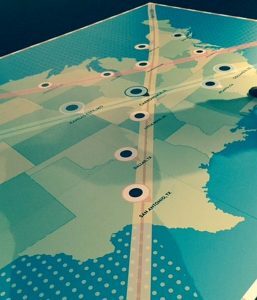 It has a terrific floor map of the total solar eclipse path for 2017, 2024 and 2099. 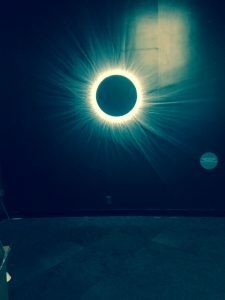 The Adler also has a total solar eclipse experience at one end of the exhibit complete with cooler air, expected sounds and a good visual eclipse. The following quote from Adler Astronomer Larry Ciupik, the Doane Observatory director, describes what he saw in Capo San Lucas, Mexico July 1991. “It didn’t matter how much I knew about it or prepared for it, my first total solar eclipse was unexpected and unlike anything I’ve ever seen!” Ciupik said on an Adler web site. Also, totality will last longer on its path. It will range from three minutes plus seconds to four minutes plus seconds over most of the United States in April 2024 instead of the two minutes plus seconds it did in August 2017. For the 2024 path click here and at Time and Date. To figure the time of the eclipse in the city you want to visit check its latitude and longitude then go to NASA Path. The information is thanks to NASA and Fred Espenak. The numbers are in Universal Time so for central daylight time subtract 5 hours and eastern daylight time subtract 4 hours. Another good resource is Earth Sky. For another map of eclipses see EarthSky Essentials. “Chasing Eclipses”is up now through through Jan. 8, 2018. The Adler Planetarium is on the Museum campus at 1300 South Lake Shore Drive Chicago, IL 60605. For ticket and other information visit Adler Planetarium and call (312) 922-7827.